Every year, thousands of animals succumb to heatstroke and suffocation because they’ve been left in an unattended vehicle. Even with the windows cracked, temperatures inside a parked car can climb from 80 degrees to 112 degrees in less than 30 minutes. It is far too easy for a quick stop at the ATM or the drug store to turn deadly—and that’s why we need your help. Leaving an animal alone in a car is more than just a bad idea, it’s a form of animal cruelty. And since the ASPCA can’t be everywhere at all times, we need YOU to be our eyes and ears on the ground. With your help, we can keep more animals safe this summer and all year long. Please take the pledge today. Immediately call animal control or 911. Local law enforcement typically has the authority to enter the vehicle and rescue the pet. Notify the mangers of nearby businesses so they can make an urgent announcement. Stay with the pet until help has arrived. It may not look like it at first, but this dog could be in danger. Do you know why? Because he has been left alone in a hot car. 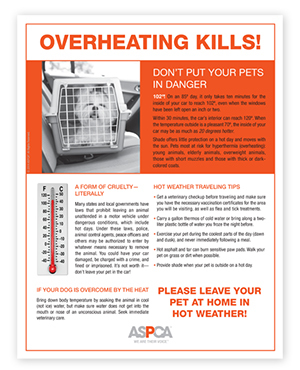 If you’re ready to take action and save lives, sign our pledge and download our free “Overheating Kills” flyer to help spread the word.